Tom Cruise is back as a special forces soldier who is called upon to investigate an army soldier who he kept dibs on in Iraq. Reacher (Cruise) is basically a ghost to the world. No credit, no identification and no set location. He is a man who travels the world and prefers to stay a mystery. The Reacher character is certainly one of the brightest points of this film. He’s smart, cool and most of all, dangerous. This film starts off great in the first hour as it creates a different kind of film for Tom Cruise. Yes, some of his dialogue is annoying, and he plays the character too cool to ever take a bad guy seriously. But it’s the investigation into the Iraq soldier that makes this film really smart and clever. One of the things it does is look into five shooting victims that happens in the opening scene of the film. Through flashbacks, it shows us the events that led to the victims being in the crime scene area that day. That is something that rarely ever happens in murder mysteries like this. The characters stories usually don’t matter because they are dead at this point, and that is where this film is different. We learn that it was no odd coincidence that anyone was in front of the gun that day. 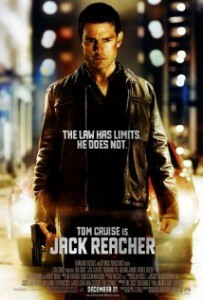 The problem with Jack Reacher is that it peters out in the final 70 minutes of the film. 130 minutes is FAR too long for a film like this. Some scenes drag out way too long with dialogue that is represented just to make for funny scenes. Robert Duvall makes a cameo as a gun store owner who strikes up a friendship with Cruise. Is this friendship needed? Not really. Duvall is wasted here playing the same old man character that he always plays. The ending falls back into that cliche world of Tom Cruise films that some either love or hate. Jack Reacher is the best effort from Tom Cruise in a long time. With that said, it’s safe to give this film a chance by renting it through Redbox. It’s a long film, but i am willing to bet that everyone will find something they like about it. Cruise fans will love that Tom is back to his hip and cool style.